Bitcoin wasn’t designed to be an investment. It’s supposed to serve, instead, as a digital currency. But when people bought Bitcoin, its price increased on the open market. That prompted others to buy it, hoping to make some easy money. This prompted me to write, Bitcoin Investors: Here’s Why Your Children Might Ignore You. At least once a generation, everyone from nannies to taxi drivers to schoolteachers to college professors fall in love with a can’t miss investment opportunity. Plenty buy in, based on castles in the sky. If that investment rises, they think their move was smart. But instead, they fall for the greater fool theory. In such cases, people can only make money if someone is foolish enough to pay more than they did. The greater fool theory doesn’t apply to a stock with ever-increasing earnings. If a business makes more money, demand for its shares rise. That moves the price up and it’s fully justified. But if a business promises to change the world, and business earnings don’t increase, that stock will disappoint. Such was the case with dotcom stocks in the late 1990s. They all promised to change the world and many of them did. But when their stock prices rose far faster than business earnings, they crashed back to Earth. Plenty of those businesses never made a profit, so their shares didn’t recover. Such is the case with Bitcoin. It doesn’t generate business earnings. That’s why Warren Buffett calls it a mirage. He says, "The idea that it [bitcoin] has some huge intrinsic value is just a joke in my view.” In a January 10th, 2018 interview with CNBC he said, "In terms of cryptocurrencies, generally, I can say with almost certainty that they will come to a bad ending." I couldn’t stop my friend’s mother from investing in Bitcoin. I couldn’t stop the nanny either. I don’t know if I stopped the taxi driver or my seminar attendees who were in search of easy money. But there’s one thing I know. Bitcoin’s price has crashed over the past 13 months. Its price peaked at $19,862 on December 18, 2017. As I write this, on January 17, 2019, it’s just $3,610. That’s a drop of 81.9 percent over 13 months. In contrast, 13 months after hitting its giddy peak on August 31, 2000, the iShares U.S. Technology Index ETF dropped 71.8 percent. 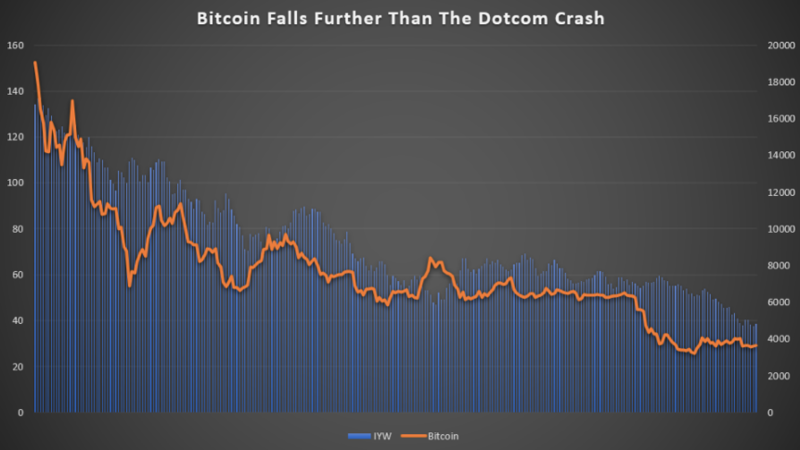 In other words, Bitcoin’s bust was bigger than the dotcom crash. Plenty of people have learned a painful lesson. But history will repeat. Before long, another generation will fall in love with a special asset. They won’t consider business earnings or intrinsic value growth. They’ll buy it based stories and castles in the sky.